Virtual Pediatrics (www.virtualpediatrics.com), a national pediatric telemedicine service dedicated specifically to children, provides immediate medical care to those sick or injured, without them having to leave the comfort of their home. Certified family and pediatric health care providers, through online webcam consultation, provide personalized treatment plans, including e-prescriptions if needed. Virtual Pediatrics is set to launch in 10 states (AZ, CA, FL, GA, IL, NJ, NY, NC, TX & VA) this month. Virtual Pediatrics dedicated and compassionate providers, who are board certified, licensed and credentialed to practice in their respective state, remain on standby for consultation from the hours of 8am to 12am, seven days a week. Children no longer need to wait a day or two to see their family doctor, nor will they have to wait in a crowded office or ER waiting room with other sick patients for minor ailments. By receiving an immediate telemedicine consultation and treatment, kids won’t miss additional days of school, parents won’t have to call out from work and worry about additional lost wages, and most importantly, sick or injured children can start getting better sooner. The cost of a Virtual Pediatrics consultation is less than many walk-in clinic fees and insurance co-pays, especially those expensive ER copays parents often pay after hours, when their doctor’s office is closed. What and Where Do Virtual Pediatrics Providers Treat? Parents can go to www.virtualpediatrics.com and click “start visit”, after which they will be directed to the registration page of our partner company, MeMD. Once the secure patient account is created, parents complete a brief medical history form for their child and submit payment, at which point they are directed to a patient care coordinator who will arrange the consultation between patient and healthcare provider. Upon completion of the webcam consultation, a Virtual Pediatrics provider will provide an individual treatment plan for the child’s ailment and, if needed, e-prescribe any medication to a local pharmacy that the family selected during the registration process. After the visit is concluded, parents can login to the patient account and print their child’s medical record as well as discharge instructions for their specific condition. Virtual Pediatrics is working toward becoming the national leader in pediatric telemedicine, while providing excellent medical care to children and families in need. In this era of social media and advanced video technology, the practice of medicine is constantly evolving, and Virtual Pediatrics is at the frontier of this rapidly developing area of pediatric healthcare. Pediamed will open in a new location in Dallas Texas. Pediamed Children’s Night Clinics provide the opportunity for Medicaid families to bring their children in for FREE acute care and not have to take time off from work. In addition, the clinics will help the state as a whole, by reducing the traffic of non-urgent visits to the emergency room. Pediamed focuses on serving the Medicaid population. Most Medicaid visits are free. Medicaid families are often forced to use the emergency room for common ailments, such as coughs and colds. They are forced to visit the emergency department because of the shortage of Medicaid providers in lower income areas of Dallas. The Parent can not afford to take the time off from work so the Parent exercises the emergency room as their only Medicaid option. In North Texas, Pediamed has entered into a contractual relationship with Parkland Community Health Plan in providing acute care to their Medicaid and CHIP members, representing close to 200,000 enrolled members within Dallas County. For more information visit pediatricnightclinic.com. Dr. Armen Ketchedjian, author of the book Will It Hurt? A Parent’s Practical Guide to Children’s Surgery, explains that the best way for parents to keep track of their child’s changing health needs is to keep up with regular appointments with the pediatrician and to log any sudden changes in temperament or physical condition following a meal. In his book, Dr. Ketch advises that most allergic reactions will express themselves in anywhere from the first minute following a meal to a few hours afterward. He recommends that parents set an appointment with their child’s pediatrician following these incidents, especially if the reaction was severe enough to warrant a hospital visit. According to the Centers for Disease Control and Prevention, over nine million children in the United States are now considered overweight or obese. But as more and more adults turn to various forms of surgery to deal with their obesity, the question arises whether or not the same medical procedures are suitable for children. Weight-loss surgery can be an effective option for some severely obese adults who have been unable to lose weight using conventional weight-loss methods. However, as with any type of surgery, there are risks and potential long-term complications. Perhaps more importantly, the long-term effects of weight-loss surgery on a child’s future growth and development are largely unknown. Some parents are convinced that weight-loss surgery may be the only solution for their child’s obesity. However, there is no guarantee that your child will get down to a normal healthy weight or keep off the weight in the long run. Dr. Armen Ketchedjian, author of the book Will It Hurt? A Parent’s Practical Guide to Children’s Surgery, cautions against this radical approach when it comes to pediatric dieting and weight loss. 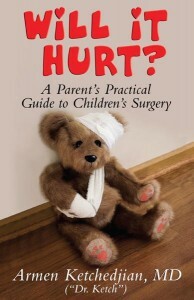 Dr. Ketch’s book, Will It Hurt?, is intended to educate parents about pediatric surgery. It is an easy-to-read resource that will give parents, their children and their families the help and reassurance they need to make any surgical experience as stress-free as possible. Listed in The Guide to America’s Top Anesthesiologists by the Consumer Research Council of America, Dr. Ketch trained at Cornell Medical Center with a fellowship at Memorial Sloan-Kettering Cancer Center and a pain management elective at Boston Children’s Hospital. He has worked to help develop new techniques in ambulatory anesthesia, taught medical students and residents and cared for more than 10,000 patients. A recent study of more than 11,000 children published in the journal Pediatrics found that door hinges and frames represent the greatest danger to small children in the form of hand and finger injuries. The results of these injuries can lead to surgery, and one prominent anesthesiologist is paving the way in helping parents understand what that means for their kids. Dr. Armen Ketchedjian, author of the book Will It Hurt? A Parent’s Practical Guide to Children’s Surgery, says that the injuries children sustain can often only be repaired through surgery, and that parents should prepare for that possibility. Most of these injuries occur when doors close on a child’s fingers, a problem made worse in countries without legislation mandating safer door systems designed to help kids stay safe. Will It Hurt? is Dr. Ketch’s way of furthering parent education in the days and hours surrounding child surgeries that result not only from injuries such as those caused by door frames and hinges, but also from developmental problems, childhood diseases and birth defects. Will It Hurt? helps educate parents about pediatric surgery. It is an easy-to-read resource that will give parents, their child and their families the help and reassurance they need to make any surgical experience as stress-free as possible. Listed in The Guide to America’s Top Anesthesiologists by the Consumer Research Council of America, Dr. Ketch trained at Cornell Medical Center, with a fellowship at Memorial Sloan-Kettering Cancer Center and a pain management elective at Boston Children’s Hospital. 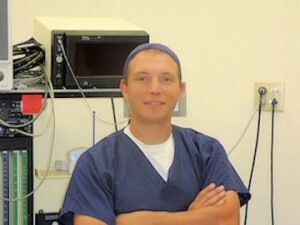 He has worked to help develop new techniques in ambulatory anesthesia, taught medical students and residents, and cared for more than 10,000 patients. A Parent’s Practical Guide to Children’s SurgerybookchildrenDr. Armen Ketchedjiandr. ketchHealthcareWill It Hurt?